Firefly Mobile is teasing their upcoming device dubbed as 'epic and enormous', but just like before, the said smartphone is already available in some of their stores prior to its proper announcement, and their latest handset is no different, meet the Firefly Mobile Aurii Magnum. The Firefly Mobile Aurii Magnum sports a 5.7-inch display with HD resolution and IPS panel topped with Corning Gorilla Glass 3. Under the hood, it still sports a 1.3GHz quad core processor just like most of its Aurii siblings, but this time around, it packs 2GB of RAM instead of the usual 1GB. Storage wise, it has 16GB of on-board memory, which can be further expanded with the use of micro SD card up to 128GB. Meanwhile, the camera department employs a dual camera system at the back of the Aurii Magnum, the primary one has a 13MP sensor, while its sidekick is not properly disclosed, but we believe it is 5MP, just like the Aurii Force Plus. On the other side, there is a 5MP snapper with its own LED flash in the front for your selfie needs. The other highlight of this handset is the huge 5,500mAh battery, if I am not mistaken, it is the highest capacity among any other Firefly Mobile devices, it is 500mAh larger than the Intense Power's 5000mAh battery pack. The rest of the specs we know so far are dual SIM with 3G connectivity, OTG function, and runs on Android 7.0 Nougat. 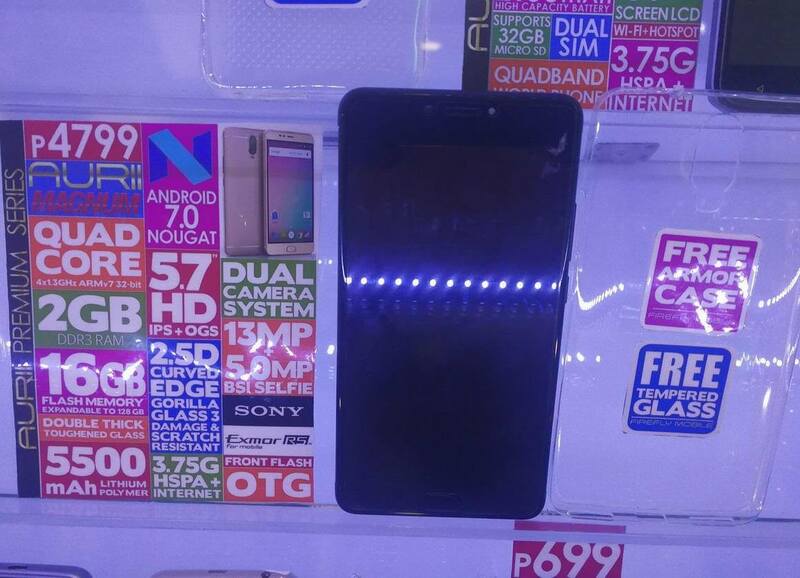 It retails for Php4,799 and comes with free armor case and tempered glass for every purchase. Legit ba dual camera neto?